The demake mod is coming along nicely. While Crowbar Collective has been remastering Half-Life 1 with Black Mesa and even expanding it with Black Mesa: Xen, another team of modders have been diligently downgrading Valve’s sequel, remaking it with the original Half-Life’s engine. We reported on Half-Life 2 Classic last year, but since then there have been some big changes and, most recently, the release of a new demo. 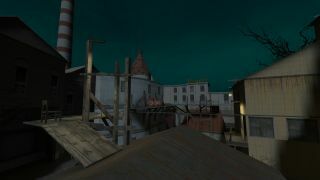 The goal for the Half-Life 2 Classic team was to recreate all of Half-Life 2 with the original Half-Life engine, GoldSrc, but last year they were still figuring some things out. For instance, did they want to try and match Half-Life 2’s style and fidelity, or did they want to downgrade everything, making the models look more like the first game’s? This year, they settled on the latter. Coast levels are also being made from scratch. The team discovered that they were simply too big for GoldSrc and, not having the engine code, they couldn’t increase the maximum limit. All the coast levels are being remade, with coast_05 being the first. Demakes like this aren’t just a way for people with ancient rigs to play newer games. Not many people, after all, are going to struggle to run Half-Life 2. In this case, it’s fascinating to see how the original engine can handle a much more ambitious game, and it’s an interesting ‘what if’, imagining a timeline where Valve didn’t make the Source Engine. The new demo appeared earlier this week and shows off Ravenholm, featuring new models, NPCs and the gravity gun. You can download it from ModDB.